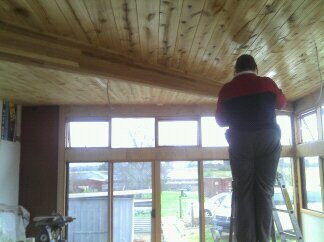 Through the Tassie winter it was time for indoor work and one of the bigger jobs was to install a ceiling in the extension. 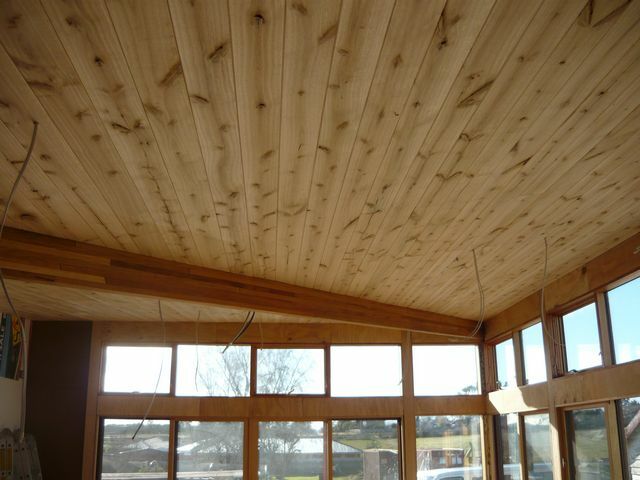 It is a cathedral ceiling with deep LVL (Laminated Veneer Lumber) rafters. 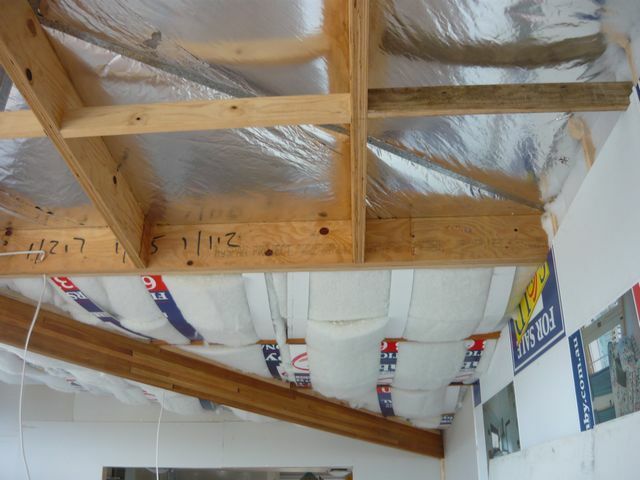 The first thing to do was to insulate well. We used wool batts and used two layers of R2.5 as we had the depth to do so. 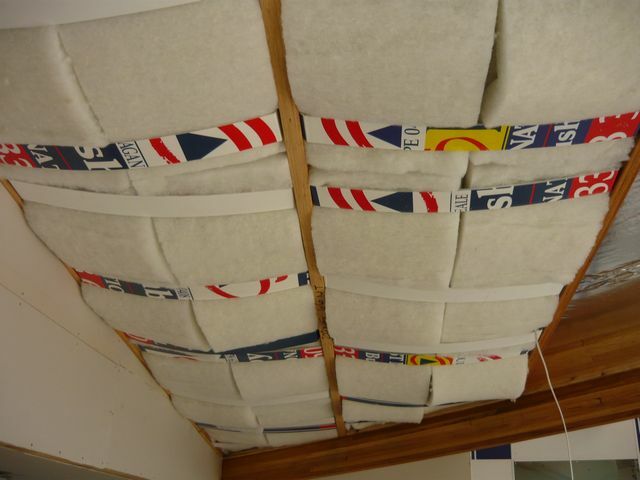 This is an Australian product with 20% polyester added to help keep the wool fibres from flattening out. Easily available from Wedds in Launceston it is a wee bit more expensive than fibreglass but then there are no glass fibres floating in the atmosphere getting in your skin pores etc. Next I Volvoxed (hard wax oil that we use on the floors) the diagonal laminated beam. 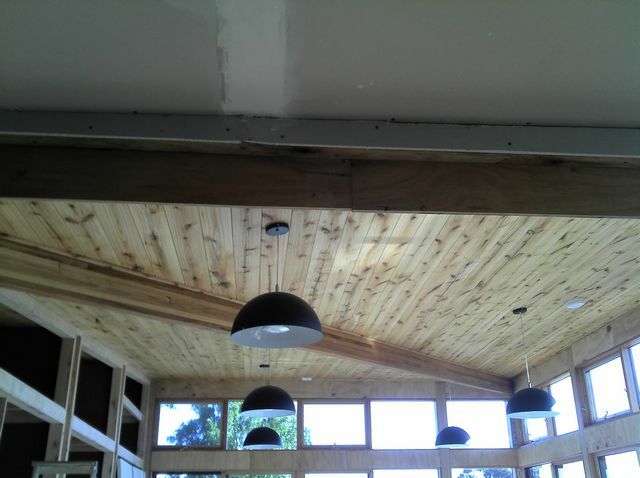 A couple of months later after helping with a friends ceiling it was time to do ours. Barry, Bart and myself worked on installing the VJ board. This was not the normal pine board as I found out that it was coming in from South America cheaper than Tassie could manufacture it!! What a crazy world. Instead I found that Timber World at Meander still had stocks of EcoAsh VJ boards. 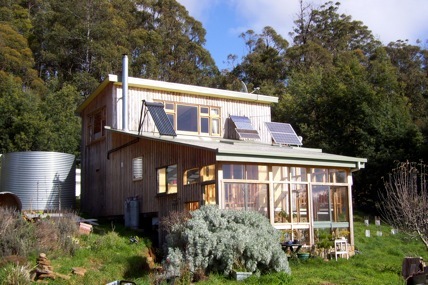 This is hardwood from Tasmania that was a product created by Forest Enterprises Australia who also made the EcoAsh studs that I used in the extension. Unfortunately they have gone out of business and you have to use pine or much more expensive hardwood. Anyway the tongue and groove was ordered and arrived. I went through it and sent 80 boards back as they were not up to scratch. This was no problem and the replacements were in much better order. Work commenced on the weekend and went quite quickly with the use of an air bradder. Mandy and I would then carry on on the Monday as the lengths got shorter and more manageable. Once installed we looked around for what to treat it with. 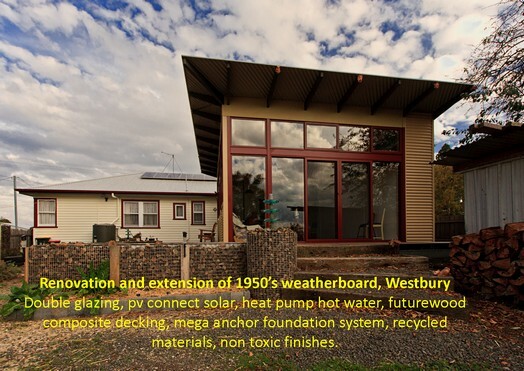 We wanted the natural look of the timber but wanted a natural product. The one we decided to use was EcoWoodOil’s Danish Oil. This was the only one that I could find that did NOT have polyurethane added. It was easy to apply and really brought the colour of the timber out. Finally we called in the electrician and fitted the 6 lampshades and CFL 150W equivalent floodlights. these are made by Philips and are only 23watts instead of their incandescent 150watt equivalent. They take a little time to warm up but they work well. We have two pairs in cold white for working and one pair in warm white for ambience.